A marathon motorist reclaims his place in Australian folklore. A marathon motorist reclaims his place in Australian folklore. Roderick Eime pays homage. Most of us think Australia’s heroes are well known. They are the men and women we read about in newspapers, history books and sports reports. At school we learn about Mawson, Simpson, Kingsford-Smith and Chisholm, but still our unknown achievers and record-breakers are creeping out of the cracks. Adelaide-born Sir Hubert Wilkins is now remembered as the first man to fly across the Arctic and take a submarine beneath the ice pack, while Mary MacKillop bounds headlong into sainthood. Yet one man, Francis Edwin Birtles, has almost disappeared into history. Born in Melbourne in 1881, Birtles was a crazy cyclist bent on breaking records. Like some Forrest Gump on wheels, he first set off from Fremantle in 1905 and didn’t stop for seven years. By 1912, he’d cycled around Australia twice and crossed the continent seven times. But his exploits in the automobile are perhaps his most remarkable. In 1912, he completed the first west-to-east crossing of the continent with Syd Ferguson and a dog. The car was a single cylinder Brush. Later with Frank Hurley and his brother Clive, he began filming his journeys creating films such as Into Australia's Unknown (1915), Across Australia in the Track of Burke and Wills and in 1919, Through Australian Wilds, following the track of Sir Ross Smith. 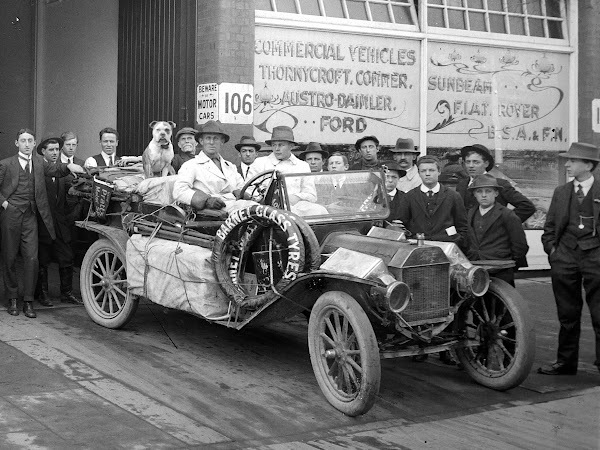 He continued to set records driving around Australia completing some 70 transcontinental crossings. In 1928 (the same year Wilkins flew the Arctic) he completed a nine month journey from London to Melbourne, becoming the first person to do so. Championed by political cartoonist and former host of Aussie Top Gear, Warren Brown, Birtles has enthralled him for his feats of mechanical and human endurance. Brown has even restored a 1925 Bean and intends to retrace Birtles’s route from London. Birtles’s first attempt at the drive in the prototype Bean Imperial Six was a disaster. The car broke down in India and so did they. Undaunted, Birtles vowed another attempt, this time in his own car, the trusty Bean 14, nicknamed “Sundowner”. This nine-month odyssey, Brown believes, is perhaps the most astonishing motoring adventure in history. Across searing deserts, through blinding snowstorms and steaming jungles, Birtles quite often made his own roads as he went. In the depression-ridden 1930s, Birtles went outback again to prospect for gold, looking for the notorious Lewis Lassiter in the meantime. He found gold, but the extreme pace of his life had taken its toll and Birtles died of heart disease in Sydney in 1941 and is buried in Waverley Cemetery. He was 60 years old. Relics of Birtles and his adventures are hard to find, but his most significant legacy is the original Bean motor car (pic right) on display at the National Museum of Australia in Canberra, donated by Birtles and Bean Cars Ltd in 1929 for the express purpose.